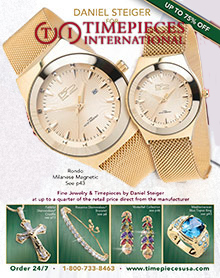 Official Daniel Steiger Manufacturer - Timepieces International is the official manufacturer for Daniel Steiger and designs from this celebrated jewelry brand feature in the jewelry collections at their jewelry store online. Luxury Jewelry Craftsmanship - Their jewelry offers exceptional craftsmanship, design and originality � all at competitive prices customers will love. The vast collection of high-quality jewelry for men and women includes bracelets, rings, pendants, earrings, and a host of accessories, reflecting a wide array of styles, designs, aspirations and trends. Daniel Steiger Watches - Using the finest materials finished to the highest standards, Timepieces International has developed an impressive range of watches that provide a purposeful, visual statement. These beautiful products are available at astonishingly low prices, often costing less than a quarter of the recommended price. You may ask how they can offer such quality at such low prices? The answer is beautifully simple: they cut out the middleman. This means there are no retail overheads to pay and not the usual mark up to make -- which can be enormous on luxury watches. Daniel Steiger Jewelry - The most beautiful gems, the most precious metals; combined by some of the most talented Jewelry designers in the world. The Daniel Steiger team travels the globe to bring you very best jewelry at a fraction of the high street price.